In recent months, one has not been able to open a newspaper without being reminded of the havoc that is being wreaked on the U.S. economy. The subprime mortgage debacle coupled with skyrocketing energy prices have caused many middle class Americans to lose confidence in taking out home loans and putting a screeching halt to consumer spending. But one place that seems somewhat impervious to the chaos: San Francisco. Part of this can be attributed to the continuing popularity of the city as a tourist destination for foreigners. Also keeping the local economy afloat is the investment in luxury real estate from those with disposable wealth purchasing second homes in this geographically desirable locale. Unfortunately, this does not spell good news for the city in terms of middle class aspiration and sustainable socio-economic diversity. Nowhere is this discordance with national realities than in the South of Market district. Two decades ago this was largely a hardscrabble district of industrial warehouses and factories. Its transformation to becoming a high income haven began with the dot.com boom of the late 1990s. Even when that boom went bust in the early 2000s --- triggering an exodus of some 25,000 people between 2000 and 2003 --- the dot-com fortune seekers had left their mark on the transformation of the district, as well as the nearby, largely Latino Mission district. Several factors drove this transformation, including the restrictive economics of starting a business in older, more upscale neighborhoods in the northern portion of the city, proximity to freeway access to the peninsula suburbs and Silicon Valley, and abundance of warehouse space contributing to an ‘edgy’ cityscape, SoMa and the Mission District took the crown as the most hip neighborhoods to live and start a business during the late 90’s. The character of the two districts, however, are quite distinct. The Mission District continues to be a mecca attracting hipsters and ‘creative’ types, while SoMa is now often derided as ‘sterile’ and rife with ‘yuppies’. One reason is that much of the residential development there is quite new, creating a distinct lack of character. Even with the abundance of recently built condos and converted lofts, only during Giants home baseball games at AT&T Park does SoMa feel like the vibrant neighborhood that is shamelessly touted by real estate agents. The elevated freeway, which feeds into the Bay Bridge as one drives east towards Oakland, acts not only as a physical but a psychological barrier between South Beach and the rest of the city. Yet not all those who live in San Francisco find the particular conditions of the location to be such a bad thing. Tai Nicolopoulos, an acquaintance who is a resident of the area and works at a technology company in a peninsula suburb, finds the area to be convenient for her commute on Caltrain-the commuter rail line that connects San Francisco with Silicon Valley. She is willing to admit, though, that when it comes to variety in terms of restaurants and entertainment options, she has to leave the area and head out to other neighborhoods. It’s not just the architecture and street life that is lacking. So too is the prescence of children. In SoMa and the adjacent Mission Bay neighborhood you hardly see the little tykes. Much hype surrounds the the Arterra, for example, a brand-new 16-story, 269 unit condominium building in Mission Bay designed to be “San Francisco’s first LEED-certified, green high-rise.” The building, called and developed by Intracorp Companies on a former brownfield site, has already sold 60 percent of its units. Despite this success, according to the sales agent, not even one family with young children has purchased a unit. The townhouse units, which are marketed more towards families with children, are having a harder time being sold than tower units. This is not surprising considering that there is a lack of amenities for children in the neighborhood. Yet in many ways, what is happening in SoMa and Mission Bay represents the future of San Francisco. Some of this has to do with politics. Since the 1960s, San Francisco has had a reputation for being a city where vocal citizens who take a ‘Not-In-My-Backyard’ attitude towards any new development are prominent. In the storied well-established neighborhoods of the city --- Nob Hill, Russian Hill and North Beach --- getting a building permit for even just a home remodel can be an arduous task. But for the former warehouse and industrial areas like SoMa, the story is completely different. Here the San Francisco Planning Department can press densification without significant opposition. In fact, the new pro-development attitude is visible in the handful of new high-rise buildings that dot the skyline. One of the most visually prominent new buildings is the 45-story One Rincon Hill condo tower just north of the western approach of the Bay Bridge. Dubbed the ‘Ionic Breeze’ for its resemblance to an object from a Sharper Image catalog, the One Rincon Hill tower foreshadows things to come. 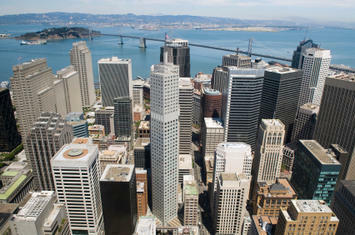 In May of this year, the city of San Francisco presented a new zoning plan for the Transbay Terminal area in SoMa. This plan allows for significant height increases for new buildings built in this zone, crowned by the proposed 1200’ tall Transbay Tower at 1st and Mission Streets. Other areas of SoMa are currently being studied by the city block by block to see what impact rezoning would have on the resulting skyline. To appease the vocal citizens who are concerned about losing their view of the topographic landscape San Francisco is famous for, the city is basing the rezoning effort around a conceptual height scheme that will make the skyline appear to “mimic” the rolling hills with “peaks and valleys” – the Transamerica Building and proposed Transbay Terminal tower being the “peaks.” The jury is still out on how this overly didactic scheme will fly with developers and NIMBYs alike. Conveniently, the current zeitgeist has a green tint provided by the density movement, something that has blunted NIMBY opposition to the city’s ongoing Manhattanization. And to be sure, dense housing makes sense when there is a demand for it like there is in San Francisco. But the question remains: what kind of city are we building? Current trends suggest the new residents of these largely “luxury units will be independently wealthy individuals buying second homes and Silicon Valley weekend warriors whose careers are based on the Peninsula but who party on in San Francisco in their often meager space time. Unlikely to settle there will be the old timers who live in rent controlled apartments in North Beach or Russian and Chinese immigrant families who call the Richmond and Sunset districts home. The developments in SoMa may well show that there is a future for a high end urban core, but the kind of diversity that long made cities such as joy may increasingly be harder to find. Submitted by luciferwilliams8552 on Tue, 06/11/2013 - 16:18. Submitted by chiendqc2s on Thu, 12/27/2012 - 10:36.